This entry was posted in Other Rolling Stock and tagged Gondola, Model, Painting, Weathering by Chris van der Heide. Bookmark the permalink. A good start to be sure. I think a few gouges and scratches would help, as well as your idea to add some powdered weathering and debris. It’ll all come together when you do the exteriors too. 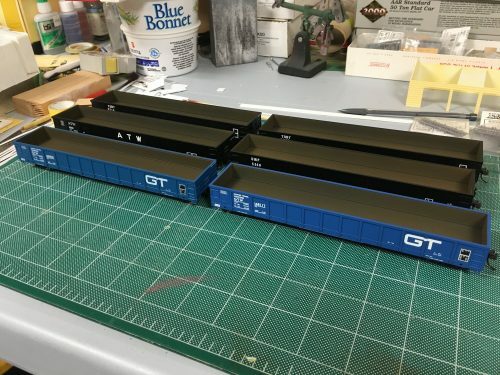 The first order of Trailer Train GONX cars included a portion with white interiors. I believe the concept was to provide better visibility to crane operators, etc. Not sure if the experiment was repeated.